The 50th wedding anniversary represents such a precious landmark in marriage--so precious that people associate it with gold. The gifts the couple receives tend to be of the gold persuasion. Parties celebrating this event feature everything from plates decorated with gold leaf to invitations lined in gold foil. The most important aspect of this golden anniversary, for many, lies in the uniting of the people touched by this couple over their 50-year marriage. Many couples plan to recommit to one another on their 50th wedding anniversary. If you are helping your parents plan a second walk down the aisle, find out how you can take an active role in the ceremony. You and your siblings can plan an extra surprise for the event, such as hiring a special band to play your parents' favorite song or a videography company to put together a documentary about your parents' lives together. 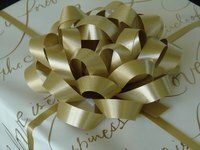 Alternatively, you can purchase a big gift together and present it at the wedding ceremony. Thoughtful gifts reflect the golden anniversary theme, such as an anniversary money tree. Spray branches with gold leaf, plant them in a gold-colored bucket, and decorate them with little bags of chocolate coins wrapped in gold foil. Add other gold “mini-gifts” like jewelry, little gold-plated photo frames with family pictures and anniversary messages written on pieces of rolled gold stationary. Fasten all the decorative items onto the tree with gold ribbon. Some cities have local candy companies that make custom candy wrappers for special occasions. Most large companies employ a graphic designer that will help you create the wrapper and candy that best represents your parents. It might include photos from their wedding, milestones in the family and pictures of you and your siblings. This gift stands alone, but you can also use it as a party favor. Plenty of couples couldn't afford a honeymoon when they were first married and promise each other that they'll take one later. If this is the case with your parents, you and your siblings can pay for the wedding trip that your parents never had. If you know where they'd like to go on a honeymoon, plan the trip and give them the tickets to their destination in the card you've gotten them for their anniversary.